As Christmas went by and then the new year, even Thanksgiving for that matter, this year it's been hard for me to “feel” these holidays/events. Not because I don't care, quite the opposite. As a matter of fact, because I do care, I did noticed the difference from the past. It used to be that these holidays/events were marked with much anticipation and then an awe inspiring experience. But lately, with almost a culmination this year, that has not been the case. Possibly because I spend most of my life these days on a hill farm without TV, advertisement, news, etc. Either way or whatever the reason may be, I've been wondering why. Why is so... ?... as I look around at snow covered trees and roofs, while feeling the warmth of my sheep wool as they surround me during morning and evening feeding time. Well the warmer temperatures are sure to be a reason -- temperatures, hence seasons, don't seem to follow what we've grown accustomed to or at least taught. It used to be that sometime during “fall/autumn”, temperatures would get lower, the air colder, days shorter, and everything kind of died back and/or slowed down. Now that's happening in December... well... well into December may I add, and this in Vermont! Way way back... a new year didn't begin in January in the middle of winter... if you will. Rather, for many cultures, and for some cultures it still does today, it began in the fall, after harvest. I have read, but mostly I have grown to feel based on my closeness to nature and animals since I've had my farm, that the fall and the end of harvest-time marked the beginning of a new year. A new beginning, which included a kind of calm and incubation period... yes during the winter months... until new life exploded in the Spring. Well I must say I've been feeling this lately and more so this year -- although a bit delayed thanks to our new seasons which are a bit different and late these past 2 years. I suppose this is so because of the closeness with nature and critters I've come to enjoy, thanks to the farm. I almost didn't need the internet for that... believe it or not... it just came to be an almost instinctive feeling that just grew to make sense. So enough of this ancient almost druid-like yapper for those of you who find these sort of things not so interesting. So... back to my next point, which again came to me during the inspiring moment of feeding my sheep their evening meal of good ol' Vermont grown hay: have you ever noticed that most and some of the most important holidays/celebrations of western culture occur in the late fall and winter? Well I did today... and thought: mmmm... yeah it's a rebirth/regenerative time because nature's asleep, critters are either in hibernation or on a more slow and sedentary period, and we humans -- well in the ancient times -- slowed down and stayed home -- really I read until very recently even wars & battles were put on hold during winter. So it makes sense that when everything and everybody is huddled up trying to stay warm and survive for new life in the Spring... we chill out... relax... and, at least we humans, celebrate! I am sure, doing a bit of an internet search on the subject will load you up with plenty of resources, searches, studies, etc. on the subject -- which is great. But I find it interesting when I come to a thought/conclusion just based on what I get back from being surrounded by beautiful life in the form of plants, trees, animals -- both wild and domesticated -- precipitations, clouds, temperature and pressure changes, etc. It's nice to know and really feel life as it starts out anew awaiting for the spring to burst and prosper!! A wonderful new program we are participating in. 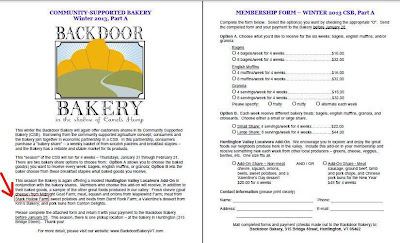 Our local baker, Backdoor Bakery here in Huntington, has started a CSB (Community Supported Bakery). You can buy a bakery share and add on a localvore share including meat from Stark Hollow Farm or other local food producers! It's great to be in community with other local food producers. 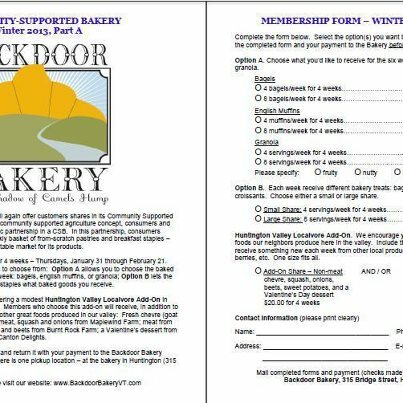 To find out more visit their website at www.backdoorbakeryvt.com.